Despite both noble and ignoble efforts, the real time strategy genre has never managed to find much traction outside of PC/Mac gaming. The micromanagement required to succeed in these games just screams for the speed and precision of a mouse. This hasn’t stopped developers from trying to awkwardly force RTS gameplay into console controller or touch inputs, however. While they struggle bravely on, it may ironically be a game that never attempted to tackle the problem at all that actually provides a vital clue to answering the riddle. When Majesty: The Fantasy Kingdom Sim [$2.99] first released back in 2000 for PC and Mac, the game was praised for its unique take on the genre. 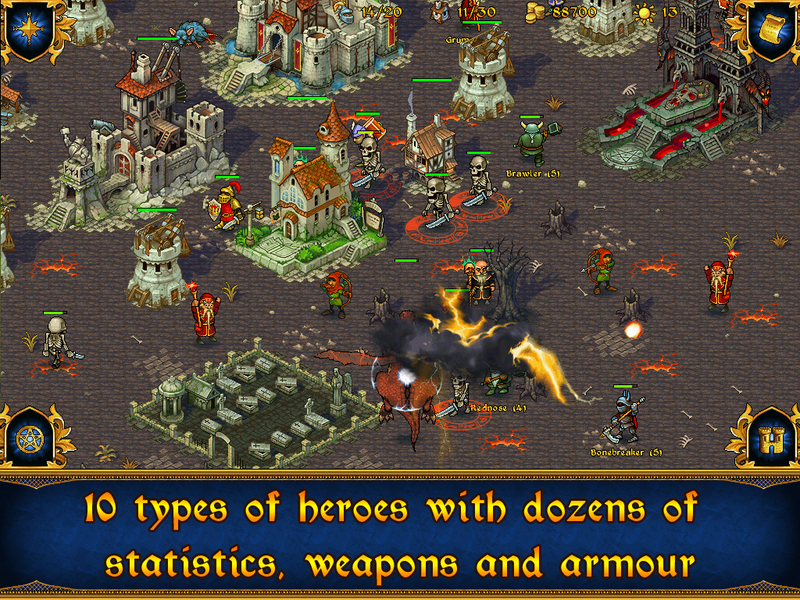 The game featured all the base building, resource gathering, and upgrade grinding that a fan of RTSs at the time could hope for, while streamlining unit management by making all heroes and henchmen autonomous. As it turns out, the iOS port of Majesty demonstrates that it may make far more sense to tailor RTS gameplay to fit the unique inputs of a platform than the other way around. So, you’re the heir to a monarch who went insane and let the kingdom go to hell in an archaic handbasket. As the new king, it’s up to you to set things right; the realm is overrun with goblins and undead and, of course, rats. While they never say it to your face, the gameplay implies that the heroes and citizens of your demesne are less than confident in your leadership qualities due to your shaky genetic background. Instead of taking direct orders from you regarding specific objectives, they act independently and must be bribed and persuaded to take action on your behalf. What’s a king without obedient vassals to do? Spend money, of course. Each level begins with your castle and a set amount of gold coin to pay for buildings. Pay for a warrior or mage guild, and you’ll be able to recruit heroes. Blacksmiths, libraries, and the like provide access to upgrades that your heroes will take advantage of as they wander by. Marketplaces speed up your gold intake while opening up magic items like healing potions and rings of protection to be bought by units. A respectable variety of different building types, upgrade trees, and prerequisites gives a great deal of room for experimentation and tweaking for optimal performance. You may have control over the type and placement of buildings, but when it comes to the heroes, they have their own set of priorities. 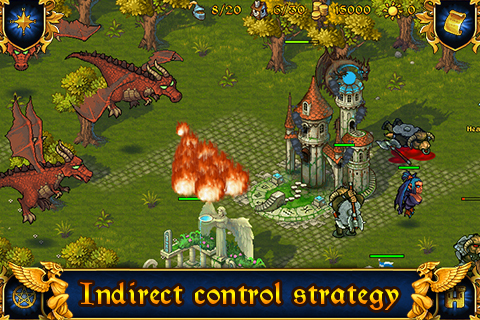 If their guild or a nearby building in the town is attacked by enemies, they will reluctantly emerge to do battle. Barring an attack, their next course of action is to make the rounds and pick up any items or upgrades from buildings that weren’t available the last time they donned their slippers and swords. These lazy bastards simply don’t get out of bed unless they are under siege or they hear the clinks of a brimming gold pouch. While heroes will occasionally get a wild hair up their breeches and decide to explore or attack enemies on their own, the fastest way to get things done is to dangle the cash carrot. You can place a waypoint over an enemy structure or unexplored area of the map and attach a bounty to it. The larger the reward, the more likely it is that heroes will wander away from the comforts of home to get rich or die trying. For those who have never played the original, this lack of direct control will drive some gamers crazy. As for myself, I occasionally muttered about how it was hard to find good help these days, but for the most part I found it extremely liberating. While the game’s core conceit survives the transition to iPhone/iPad famously, that’s not to say that this port handles all things touchscreen with equal grace. 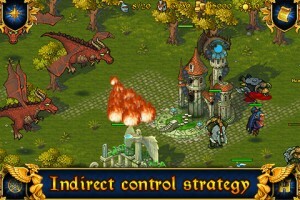 Positioning of buildings and waypoints is occasionally troublesome, as is the targeting of your spells. The user interface is also unfriendly. Spells are denoted by icon only, so determining the function and efficacy of your arcane arsenal is problematic. The fact that the game is universal is nice, but ye olde ugly font that is readable on my iPad is much trickier to decipher on an iPhone screen. Playing with the larger device is recommended for those with the option. Majesty’s focus on building and bounties as primary game mechanics eliminates the clicks-per-minute pressure of most RTS titles that simply doesn’t translate to a touch screen. The result is more fun and less frustration. If this had been a new title built specifically for iOS, I would have called it a stroke of genius. As it is, I’ll have to call it a pleasant serendipity. Not too frantic and not too dumbed down, the port just seems to fit. I’d love to see other developers look at this game and make the mechanic a deliberate iOS design choice.